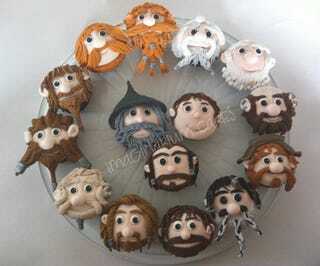 To celebrate the release of The Hobbit, Wellington bakery Imaginarium Cakes made a baker's dozen (plus Gandalf, Bilbo, and Gollum) of Hobbit cupcakes, icing each one to carefully match its corresponding character's hairstyle and facial hair. The Bifur axe in the head is especially adorable, but I tip my Bofur hat to whoever had the patience to ice all the details on Glóin's beard. The baker also hosted a private screening of the film, accompanied by dragon-scorched cupcakes, featuring Tolkien's illustration of Smaug from the original Hobbit cover atop each one. I'm sure they were as delicious as they were heartrending to eat.